Whilst watching the Football League Show this morning - is it me, or does Steve Claridge always sound bored ... which is rather apt, bearing in mind that most of what he says his yawn-inducing waffle of the highest zzzzzz - I was reminded of Stevenage's upcoming FA Cup replay at Sh!te Hart Lane (apparently the 'Borough' haven't won since the original tie). 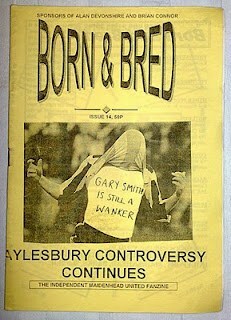 As such, I suspect that they'll be plenty more press articles in the coming days highlighting the (relatively new) Stevenage manager's links to both T*ttenham Hotspur and Arsenal. P.S. (and O/T) ~ Great result for Drax and the boyz yesterday. Well done all.